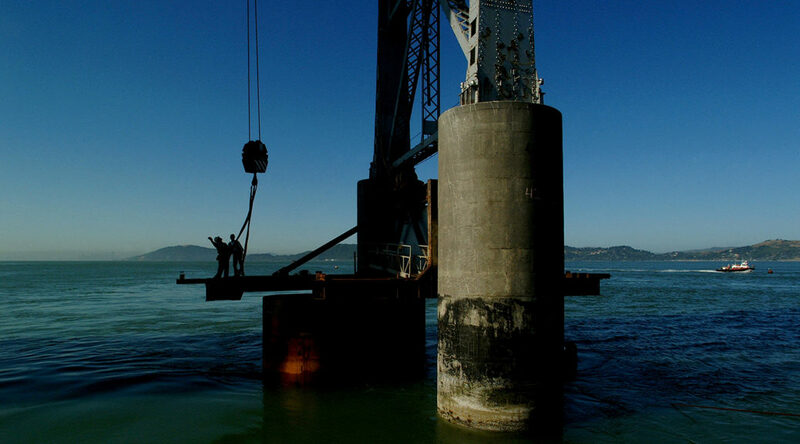 Tutor-Saliba retrofitted the Richmond-San Rafael Bridge a few years ago. A foggy view of the bridge. This was a huge project, much of it occurring under water. A worker on the bridge project, viewed from above. The bridge from a driver’s point-of-view. I loved the way the late afternoon light illuminated the inside of the steel structure. The sunlight looked pretty good on the outside, also. Overview of the project, from the Richmond side. The bridge design allows for traffic to exist on two levels. The amazing communication that always occurs between crane operators and engineers on the ground. A bird’s-eye view of the bridge upgrade. Tutor-Saliba has a yard in Fontana, California where machines of various functionality are stored for future projects. Close-up of hooks designed to lift things. The day I went out there was a particularly beautiful afternoon, enhancing these well-used machines. We went up in a scissors truck in order to get the aerial perspective. Sometimes the details are more interesting than the thing itself. Another example of a piece of metal looking cool in the right environment. Some welding being done in the yard, probably preparing something to be put to use again. Welding is one of those things that create beautiful imagery. I presume these to be leftover steel beams. Another abstract created by stacked steel pieces. Late in the day, some items become nice silhouettes. A parting shot of the Fontana Yard.